Release Date: December 25th, 2005 by New Line Cinema. 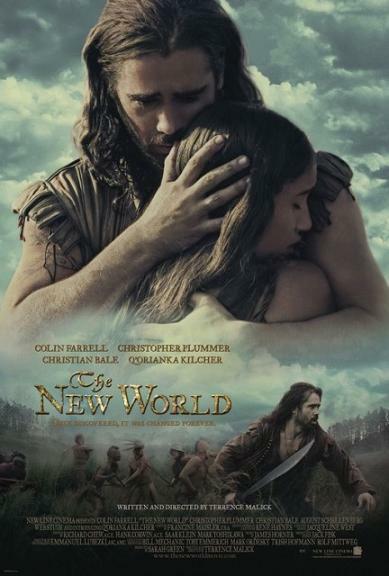 The Cast: Colin Farrell, Q’Orianka Kilcher, Christian Bale, Christopher Plummer, Ben Chaplin, Jamie Harris, Joe Inscoe, Eddie Marsan, Ben Mendelsohn, Michael Greyeyes. Directed by Terrence Malick. BASIC PREMISE: During the 17th Century, Captain Newport (Plummer) and his crew arrive at Jamestown where Captain John Smith (Farrell) secretly falls in love with a native, Pocahontas (Kilcher). ENTERTAINMENT VALUE: The first half The New World works the best in terms of plot and character development. In these scenes, John Smith meets the natives and ends up fighting them. He secretly has his eye on beautiful, young Pocahontas, who saves his life. There are many beautiful scenes as he gently touches her face while she longingly looks into his eyes. Their forbidden love doesn’t last for long when John returns to his men who wait for him to bring back food. His tardiness leads them to suspect that he had fallen in love with a native—which he doesn’t deny. Naturally, he loses his rank and gets imprisoned. Believe it or not, The New World takes over an hour to reach this point in the story. Until the, writer-director Terrence Malick hits you over the head with the fact that John Smith and Pocahontas are in love. The many scenes of nature look lush and breathtakingly picturesque as if they were a painting. For example, the tall trees sway in the wind and water calmly flows through a river. Terrence Malick sure does love nature. When John Rolfe (Bale) appears to claim Pocahontas, that’s when the plot becomes less engaging and even contrived. Pocahontas believes that her true lover has died at sea, so, somehow, she accepts this stranger’s advances. The entire relationship between them just feels rushed. Very few scenes show them living together, even when they move back to Britain. In this third act, the plot skips Pocahontas’ difficult adjustment to this civilized world and goes straight to the scenes where her true lover desperately searches for her. On a positive note, Q’Oriankia Kilcher shows a lot of promise as Pocahontas. She’s truly charming and genuinely beautiful, so you’ll understand what the two Johns see in her. However, it’s not quite clear what she sees in them on a non-physical level. SPIRITUAL VALUE: There are a few exceptionally enchanting scenes drenched with romance between Pocahontas and John Smith, especially when they briefly make love. The minimal dialogue allows you to simply absorb the images and sounds, many of which are a part of nature. Unfortunately, there’s nothing insightful, even when Pocahontas travels with John Rolfe to Britain. Her adjustment to this different lifestyle would have been thought-provoking if it weren’t skipped. INSULT TO YOUR INTELLIGENCE: Occasionally Contrived, especially in the second half. THE BOTTOM LINE: Enchanting, beautifully-shot with a contrived, unemotional second half.